This statue of Buddha was spotted in the store window of Daffy's - a regional discount clothes and home goods department store. 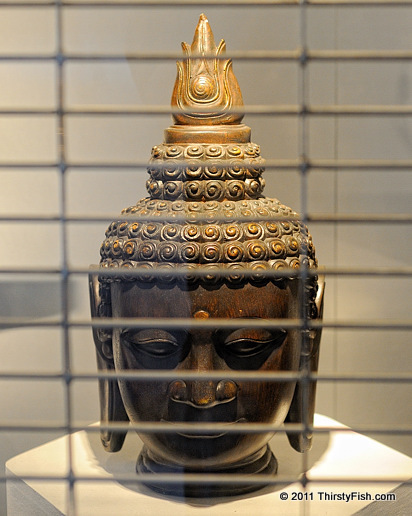 25 Centuries after his lifetime, Buddha has become a "window dressing" in a discount store?! "Window Dressing" has become a figure of speech to mean: things or acts that make an inflated positive impression of something in a dishonest or deceptive way. It is often used in the context of financial entities (e.g. mutual funds, banks, corporations) selectively presenting their more successful investments. Cherry Picking; suppressing evidence or presenting incomplete evidence, is a fallacy as old as mankind. Incidentally, Buddha taught that the way leading to the end of suffering is through The Noble Eightfold Path, the first layer of which is "viewing reality as it is, not just as it appears to be" (samma ditthi/right understanding). The teachings of Buddha are for the most part incompatible with the way most of us in the West lead our lives. We subconsciously learn how to "Window Dress" ourselves and the things we do. We persistently manipulate how we are perceived by constantly cherry picking our best qualities. We are not interested in viewing or presenting reality as it is; we are content with appearances. We do not question our intentions and always justify our actions. We focus on finding the shortest routes to reach our specific goals with little regard for consequences. Who needs Buddha?